Paris, August 26,2015.- In 1983, Steve Jobs, Founder of Apple Computers, was walking by the New York headquarters of IBM and gave them a photo of a comb as a souvenir. In 2014, IBM and Apple presented an ambitious deal whereby they would make corporate solutions together. Two very tenacious rivals ended up becoming associates. Will the same happen with Uber and the sector of transported goods? Uber Technologies is an American Company (San Francisco, California) created in 2009 by Garrett Camp and Travis Kalanick (CEO). Its main shareholders are: Google Ventures, BlackRock, TPG, Benchmark, Goldam Saches and Jeff Bezos, amongst others. Uber’s main business model is to transport people with medium to high range vehicles with a driver that are available through an application for smartphones. Six years later they Uber offers this service to more than 100 cities threw out the world. The company is worth close to 50.000 million dollars, more than FedEx, Xiamoi and doubles Twitter’s worth. This is a great success story for Uber’s CEO, Travis Kalanick, whom his own Company describe as follows: “Be it the creation of the first P2P search engine in the world or the development of the main distribution system for Enterprise Content Management, Travis thinks that every problem has a solution. You only have to be creative enough to find it. He has guided the company from a niche on the San Francisco market to its present global presence. On his way to success, Travis has guided other enthusiastic entrepreneurs at their beginnings and invested actively in them. Also he somehow managed to become the second highest ranker at Wii Tennis in the world. Game, set and match”. At present, Uber cannot to be commercialized in various countries, including Spain, because of rivalry with similar services such as taxis. Uber launches in Barcelona a completely new service, previously tested in Los Angeles under the name UberFresh, consisting in sending food within 10 minutes. The restaurant selected amongst a PlateSelector, will offer a different specialty every day. Is Ubercargo a rival for professional transporters? Uber launched last January a service to transport goods. Uber describes as follows this addition to its APP for passengers: “With UberCARGO, your goods travel like a VIP. The same cashless and convenient service you have grown to love through UberBLACK and uberTAXI is now available for all your moving and delivery needs. Whether you’re going cycling in Dragon’s Back, moving a mattress to a new house, riding with a large pet, or sending items to a friend, UberCARGO is for you. If you own a business, UberCARGO provides an easy way to cover on-demand logistical needs without complicated & costly delivery arrangements. With UberCARGO, a van arrives wherever you want it to be in minutes. You can load your items in the back of the van yourself or request the driver’s assistance if you need an extra hand. Deliveries can easily be tracked in real-time through the app, the item’s location can be shared with the recipient and you can even ride along with your goods so you’ll have ease of mind that your items are safe. Rates are calculated based on time & distance. Because UberCARGO trips require loading and unloading time, drivers will begin the trip upon meeting with the rider and end the trip when any unloading is finished.UberCARGO is an Uber Everything experiment focused on making every day city living easier so you have more time to do what matter most. We’re aiming for the same level of quality as what you’ve come to expect from other Uber services but we need your help to see how we’re doing”. Should the traditional professionals in transports be afraid of this new service? Do medium and large sized transport fleets see Ubercargo as a serious menace in such a short time? How can they compete against this new rival? These are rhetoric questions of which the context AndSoft fully understands, also the regulation of the transport sector in each European country should always be respected. This is a free market, but to be a part of it you need to play by its rules. 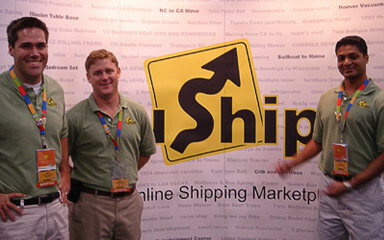 uShip, is a company created in 2004 by Mat Chasen (CEO), and they use an alternative mode of transport (a part from the transport Company and transport agency): A person publishes an add to transport some goods and transporters (professionals and autonomous) bid to get the order. uShip has at its disposal 670.000 transporters threw out the world. Their main associates are: ebay, Ritchie Bros, proxibid, boats.com, Yachtworld, amongst others. Víctor Vilas, Director of Business Development for AndSoft, exposes the position of the company faced with this new situation on the transport market in Europe: “The problem with Uber is not the model they use, but that they are going against established models. And when I say models I mean legislations. If we center ourselves on the transport sector it is clear it has been harped with legislations, taxes, norms and rules that are shared. Be they from national or global organism, and they are specific to each country. In most cases these rules are only under cover fees. As a matter of fact, the Uber model has existed for a while now. What I mean is it has been legal for some time. A person calls a company to ask for a transport, the person is given a price and will be able to contrast that price. If the person is interested they will say yes to the price and contract the services of an agency or a Messenger, amongst others. In comparison there is also another model. A friend can offer you their services, both parties come to an agreement and the service is provided. The problem with this model is that it is not legal and that the service is not guaranteed. Uber has legalized this second model, making hidden costs official, and this is positive for a lot of people who can now make have a wage, that the market has up to now made impossible, but that is apart from the strict legislations of the transport sector. I recommend you read the following analysis: http://www.truthaboutuber.com/truth/transportion-company/. I agree with the fact that the future cannot follow that that is established, normally rules are always changing, but this is a legal problem that affects our clients directly. They cannot compete in a direct manner because they are not governed by the same rules”. AndSoft understands the market and applies the latest tendencies to its technological solutions for the transport of goods and logistics. I understand the competitiveness and the added value of the different scenarios we can be confronted with. AndSoft supports proactively its clients in the market settings the law has established for them to be competitive in each country. To sum up, AndSoft is in constant innovation in the processes of information, internal and external. This philosophy, together with new strategic alliances with better suppliers of transport and logistics software will enable the professional transport of goods to progress.